MASTER ignition | IMFsoft, s.r.o. Broad range ECU to control ignition and injection. For use in all types of motorcycles, go-karts, cars, motor-cross-seaters, ... simply for general use from hobby to professional racing and aircraft engines, turbines, cogeneration units, generating stations and other applications with 1-16 cylinders (depending on type). Easy installation and setup. 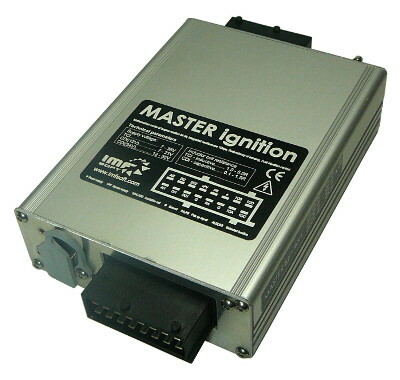 The product MASTER ignition is a brand new series of ECU units without any direct succession to the previous models. It is the experience in development of industrial and transport safety systems, ignition units and particularly our customers’ needs which provided a foundation for the idea and realisation of the new model. The unit MASTER ignition has been functionally designed in order to control advance or injection of combustion engines ranging from one to sixteen cylinders (depending on type), with whatever configuration of scanned teeth, types of sensors and features like 5D maps of advance and injection control, integrated pressure sensor, temperature, tachometer output, strobe lamp, charging control, engine speed and turbo preassure PID regulation, control switching on of fuel pump. MASTER unit contain CDI, TCI or combined outputs. The list of features mentioned above determines MASTER ignition to be used either for a service or tunning replacement of all conventional motorcycle or automobile ECU units, usable for ignition or injection coil control. The integrated redundancy of sensing, together with other key features makes Master ignition very suitable for marine and aviation applications, moreover, thanks to the wide range of operating revolutions can be also used for turbines. The function of MASTER ignition relies on FPGA technology, which provides digital-analog conversion of sensor signal, as well as its evaluation and calculation of the mathematical model of the real rotation. Simultaneously, it deals with other operations i.e. redundancy sensing, total control of CDI converter, advanced features and signal records. FPGA technology is interesting not only for its high operating performance but particularly for its accuracy, which in principle microprocessor-based systems cannot achieve. Besides these TCI/CDI outputs which differ units, there are available 4 analog/digital outputs, 2 digital inputs and 2 inputs for rotation sensor, at every type of units listed below. DIN brackets - On request, any unit can be fitted with an aluminum bracket for the DIN rail. 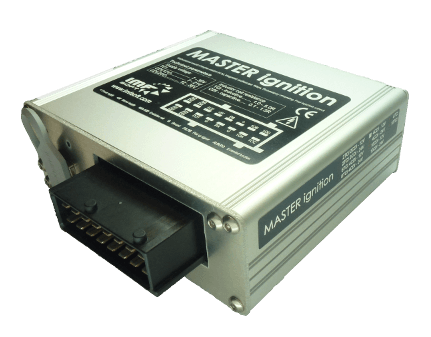 MASTER ignition can be also done in other combination like 4CDI 8TCI, give us an email inquiry, please. All CDI variations above are also possible for 24V (12V – 36V), on demand, please state note in your order. This is an operational display of function and status of ignition unit MASTER. In order to have functional display it is necessary to have USB connection and switch power supply on. Maps provide a fast tool to display and model individual curves in advance  –  in full angle range ±360°. The given figure influences the moment of output switch from 1OA to 1OH. By using digital (DI1, DI2) or analogue outputs AI1, AI2, PA, PB) it is possible to operationally switch among the maps. Configuring the sensing of engine rotation is the key part of ignition unit MASTER ignition. Within its setting it is possible to select Pick Up voltage sensing level and adapt this level for more range of engine speed. There are other settings to be selected such as filter setting, angles of Trigger Wheel teeth maps or alternatively second level of voltage for synchronisation. Pick Up voltage sensing level and Trigger Wheel teeth map are predefined for many application Eg. BOSCH 60-2, BOSCH 36-2, BOSCH 2+1, BMW 36-1, FORD 36-1, SUZUKI 24-2, YAMAHA 16-2, HARLEY 32-2. Oscilloscopic record is used in order to graphically visualise measured and calculated data. This helps to quickly evaluate the proper and accurate function of ignition unit MASTER. It can thus evaluate the correctness of voltage sensing, counting teeth of mathematic model of the real rotation and angels of closing of output coils. An example to be given; curve angle of engine displacement must be regularly and horizontally increased from 0 to 360°. If there is any change of steepness in the curve or the angle is shorten, the problem is to be found either in wrong angle set up, number of teeth, the type of synchronisation or unsuitable voltage for sensing. Comparison of spark performance between MASTER ignition and competitive ignition. is determined to scan crank-shaft or cam-shaft position of combustion engine.